Bert Mobil (BM) are containerized biogas plants. 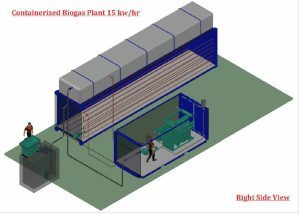 This allows to industrially pre-manufacture biogas plant. BM will be delivered by trucks and can be installed within 3-5 days. Industrial manufacturing allows us to offer attractive prices. BM is ideal for animal slurry starting from 3 – 9 to / day, producing 10-40 kW. Annually this means 86.000 – 344.000 kW/h. All other biomass can be used too! BM offer many applications next to power productions: space cooling, refrigeration, heating and compressed biogas (CBG). The digestate is a non-smelly fine fertilizer. BM can be combined with a digestate treatment plant, if digestate can not be used as fertilizer. Check FAQ for more details. GENSET operators can now add BM to save on fossil fuels. This will reduce the Genset OPEX. Gensets need to be retrofitted to dual fuel in order to burn biogas.